The reasons people click on paid search ads depend on age and which search engine they use. Study the factors that impact how people engage with paid search advertising to inform how your business invests in SEO services and structures its search marketing strategy. Search engines are where your business makes a first impression on potential customers. 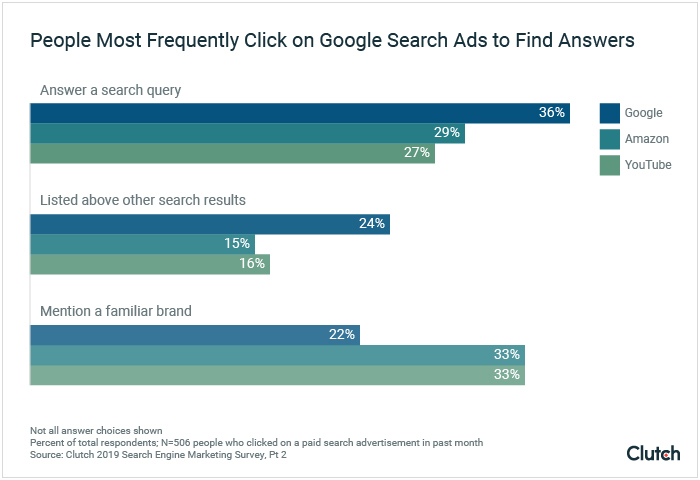 We surveyed 506 people who clicked on a paid search ad in the past month to learn about their preferences for search engine advertising: the reasons they click on paid search ads, the type of ads they click on, and which search engine they use when they click on ads. Paid search engine marketing, such as pay-per-click (PPC) advertising, isn’t the only form of search marketing, though. Your business should also invest in SEO services to improve its organic search rankings. 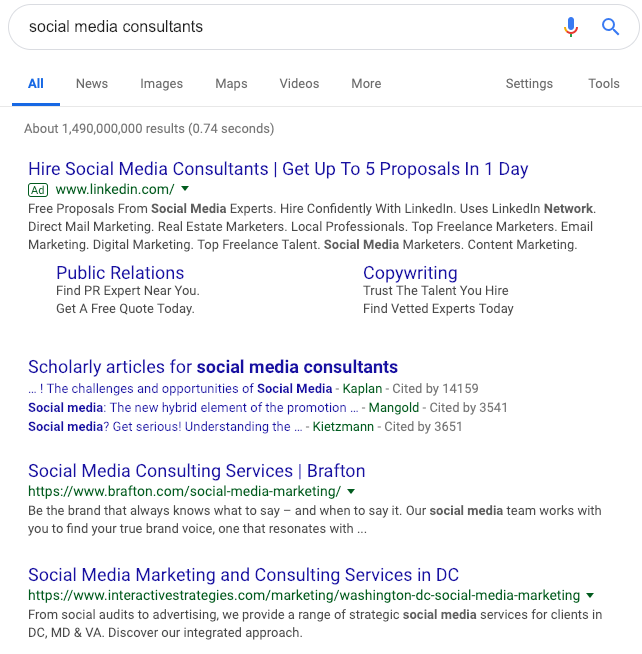 In fact, PPC often serves as an effective complement to SEO services by providing analytics that your business can use to inform its long-term search marketing strategy. This report analyzes the factors that determine why people engage with paid search ads. 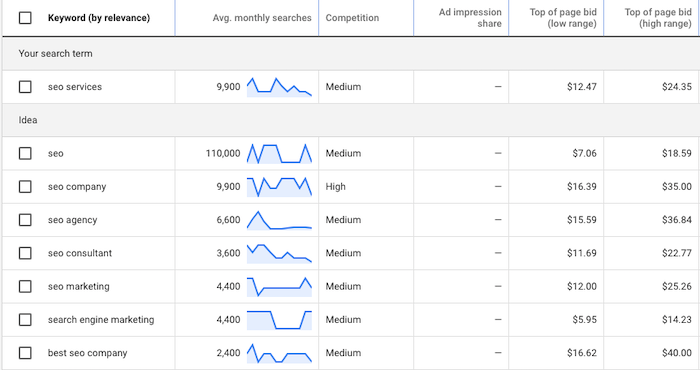 Using this data, your businesses can learn how to create an effective search marketing strategy that includes multi-platform PPC advertising and organic SEO. People respond to search engine results that are the most relevant to them. One-third of people (33%) click on a paid search ad because it directly responds to their search query. More than three-fourths of people (77%) say they can confidently distinguish paid search ads from organic search results, which means its important for businesses to maintain consistent messaging across their search engine ads. Age impacts which search ads people click on: Baby boomers (38%) are the most likely to click on branded paid search ads and the least likely (13%) to consider whether a search ad ranks above other results. Google users are the most likely to click on paid search ads that directly respond to their search (36%) and are listed above other results (24%). The primary reason people click on a YouTube or Amazon search ad is because it mentions a familiar brand (33%). Your business’ search marketing strategy should begin with understanding how people use search engines to find information online. The most basic element of search marketing is the keyword. People search for keywords that reflect their interests: solutions to business challenges such as finding a social media expert, the missing step in a recipe, or a football team’s upcoming opponent. People are the most likely to click on paid search ads that directly answer their search queries. The goal for your business is to appear among the search results for the keywords your target customers search. The first step of your search marketing strategy is keyword research to understand which terms your target customers search and to inform the keywords your business targets for its search ads. Through keyword research, you can identify the most valuable keywords to target for PPC advertising. Using keyword data, you can format your paid search ads and site content to appeal directly to your target customers based on the terms they search. Keyword research also gives insight to people’s purchasing intent, or how likely they are to make a purchase at that moment. For example, if you are an SEO company, you can be confident that people who search “SEO marketing” likely are not interested in hiring your company immediately, based on the broad language they use in their search query. People who search “best SEO company,” on the other hand, likely are interested in finding an SEO services company now. Bidding on this term may result in a more direct return on your search marketing investment since people who search for this term have higher purchasing intent. After keyword research, begin creating paid search ads. Creating relevant search ads for target search terms across different platforms such as Google, Amazon, YouTube, and Bing provides people with a consistent and transparent experience with your brand. For the most part, people recognize paid search advertising. More than three-fourths of people (77%) say they can confidently distinguish between organic and paid search results. Since people often understand the difference between paid and organic search results, consistent brand messaging across paid ads and organic results signals that your company is a trusted source of information about a topic. Consistent and relevant brand messaging across different search engines creates brand recognition for your target audience. To create an effective search marketing strategy, it’s crucial to understand the factors that impact how people engage with search ads and organic search results. “It's important to think about who is using [search] platforms and what they're being used for,” said Laura Simis, branding and communications manager at Coalmarch, a marketing and lead generation company that specializes in lawn care and pest control companies. The search ads people click on and the reasons why they click on them vary by age. Baby boomers (ages 55+) prefer paid search ads that mention a brand they are familiar with. Nearly 40% click on ads that feature a familiar brand. Younger generations – millennials (ages 18-34) and Generation Xers (ages 35-54) – are most likely to click on ads that respond directly to their search. Baby boomers also are the least likely (13%) to consider whether an ad appears above other search results. Older generations tend to be less digitally-savvy than younger generations and more familiar with traditional brand advertising, which fosters some distrust of search results. These two factors make branded search ads appealing for them, said Natalia Wulfe, head of marketing at Effective Spend, an SEO and PPC agency in Austin, Texas. Understanding how age affects how people click on search ads can help your business maximize the effectiveness of its search marketing budget. For example, you can bid for lower-value brand-related terms to engage baby boomers, since they react more to brand names than to where an ad ranks in search results. You can also use demographic data to inform how you spread your PPC spend across different search engines. Baby boomers are the least likely to click on Google ads (57%) and the most likely to click on a Bing search ad (13%). This finding can help maximize the return on your PPC investment: Bing Ads have higher click-through rates than Google search ads, especially for financial and shopping related searches. Optimizing your search marketing according to age allows you to save money on ads while focusing on engaging the most people possible through search. The reasons people click on search ads also vary by the search engine they use to find information. 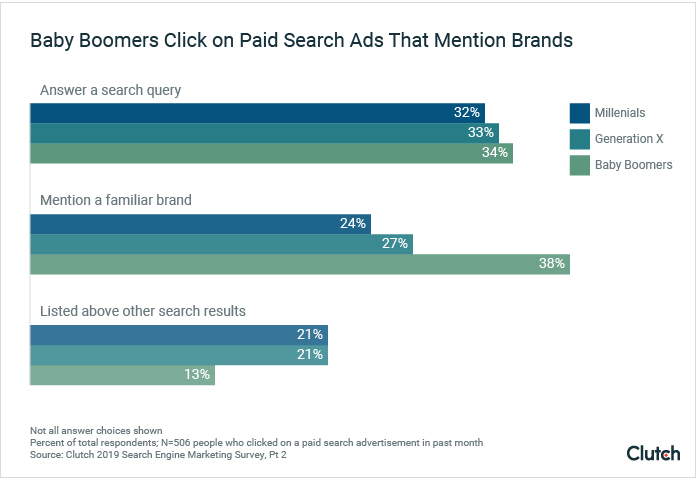 Google users are the most likely to click on a paid search ad because it directly answers their search query (36%) or is listed above other search results (24%). One-third (33%) of Amazon and YouTube users, on the other hand, primarily click on paid search ads that feature a brand they are familiar with. The type of paid search listings people click on aligns with the primary function of the search engine they use. People search for products and brands on Amazon and YouTube but often use Google to find local services or businesses that may be less recognizable to the average person. You need to invest in PPC ads on different search platforms based on the product or service you are promoting. If you are a local services provider, Google may be the best option. Consumer products companies, though, may find more success on Amazon and YouTube. Paid search engine marketing earns clicks and positive brand impressions for your company. To achieve the same benefits from organic search results, you need to invest in SEO services. In fact, SEO services are the key to long-term search success: Effective SEO can create a positive feedback cycle that sustains your search rankings over time. Ultimately, combining PPC advertising and organic SEO helps companies best engage their audience with relevant search results both now and in the future. Pay-per-click advertising is a launching point for your business to interact with search engine users. Since paid search ads are the first thing people encounter when they search, PPC ads are an excellent opportunity to establish a positive brand impression. PPC ads also allow your company to tailor people’s experience with your brand by directing them to curated pages on your site. Advertisers create site content such as dedicated landing pages that are designed specifically for search ad campaigns, said Justin Seibert, president of Direct Online Marketing, a digital marketing services company in Pittsburgh. These pages allow your business to control and optimize people's entire experience with your content. 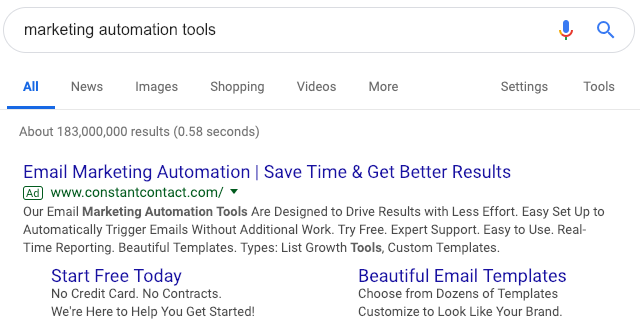 For example, if you search “marketing automation tools,” an ad for Constant Contact, an email marketing software company, occupies the top result. Clicking through on this listing directs you to a landing page on Constant Contact’s site that prompts users to start a free trial of its services. Constant Contact can earn new users (in the short-term) with two steps: click on its ad and enter an email. PPC advertising, though, requires balance. You need a dedicated budget to bid and pay for ads over time. The more successful your paid search ads, the more you have to pay, since PPC is a cost-per-click (CPC) model. To earn long-term search marketing benefits such as site visits that don’t require direct purchasing, your company needs to invest in SEO services. SEO services improve your website’s ranking in organic search results and earn long-term engagement with your audiences. Strong organic SEO can be self-sustaining. When people click-through to your website from search, it signals to Google that your site is a relevant and authoritative source of information about a topic. Click-throughs improve the chance your site continues to appear among the top results for related search queries. To understand the search results people are most likely to click, audit your PPC advertising campaigns. Optimize your meta tags: Format your meta tags to feature the keywords that drive the most engagement on your paid search ads. Create content that drives engagement: Study the content of the search ads people click on. Focus on its format (e.g., text, video, product listings), tone, and topic. Use this data to create content on your site that is most likely to interest your target audience. Relevant content that matches people’s search intent earns inbound links, site traffic, and engages your target customers throughout their purchasing journey. There are a variety of other SEO services you can invest in to improve your organic search rankings. Using results from your PPC campaigns improves the success for your organic search marketing efforts. The price of organic SEO is not as explicit as PPC advertising, though you still need to budget. Time and training: Effective maintenance of high-quality SEO services requires time and attention. The time you spend training staff on SEO basics and maintaining SEO efforts equals the cost of labor for those tasks. Service providers: If you don’t have the bandwidth to use in-house resources for SEO services, hiring an SEO expert allows you to maintain strong SEO. The cost of an SEO company depends on factors such as the scope of services you require and the type of SEO company you decide to hire. Keep in mind the resources and costs associated with organic SEO services when formatting your search marketing budget. Search marketing begins with targeting the keywords your target customers search online. It performs best when your keywords align with your audience's search queries. The more directly you answer or match searcher intent, the more engagement you can earn through search. If you can create ads and populate organic results with content that provides relevant information and has consistent messaging, people will trust your company as a source of information – and potentially as a business partner. Understanding the factors that influence which paid search ads and organic results they click on can help you format an effective search marketing strategy. For example, people’s age and search engine preferences determine the reasons why they click on paid search ads. Invest in PPC advertising and SEO services to achieve targeted site traffic and engagement in the short and long-term. Clutch surveyed 506 people who clicked on a paid search advertisement in the past month. Over half (54%) of respondents were millennials (ages 18-34); 36% were Generation Xers (ages 35-54); 10% were baby boomers (ages 55+). Two-thirds (66%) of respondents were female, and 34% were male.